chance to drop: Poison Solvents, Clean Pelts. Giant Snakes are large serpents found in many different zones. They have a critter version, Snake, which cannot attack. The snake whips its tail, doing moderate physical damage as well as staggering all players as indicated by a red cone. Blocking will prevent the stagger. The snake lunges at the player, doing moderate poison damage over time to the player. This attack can be blocked to set the enemy off balance. If low on health, the snake will curl up and heal itself. This can be interrupted to set the enemy off balance. 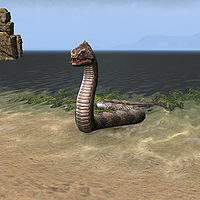 Some giant snake enemies in Craglorn are simply called Snakes and are slightly smaller than usual. This page was last modified on 7 October 2018, at 11:57.